Anyone hearing this disc for the very first time might well conclude that this is the weirdest album ever produced. 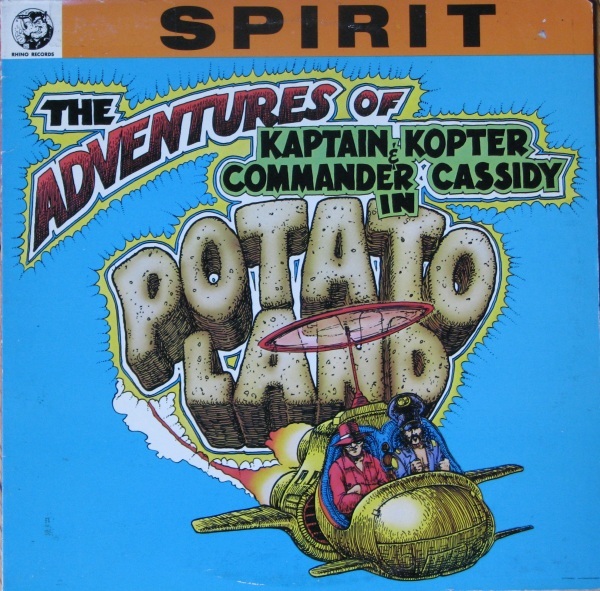 On one level there is an Orwellian concept running through all the tracks, but it’s presented in a whimsical comic book-like story about our two adventurers (Kaptain Kopter and Commander Cassidy, the two principals in Spirit) visiting a world inhabited by giant potato people. This album was intended to be the follow-up to Randy California’s Kapt Kopter and the (Fabulous) Twirly Birds, but when the band presented it to Epic, they refused to release it, and eventually cancelled Spirit’s contract over it, leaving the band without a label. 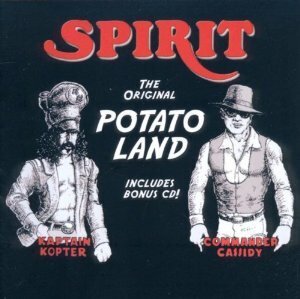 Before that all happened, in early 1973, while Spirit was touring the UK, they made an appearance on Bob Harris’ BBC radio show, at which time the entire first side of the yet-to-be-released Potato Land album was played. Many listeners taped that show in anticipation of the album’s release, but after months went by with no release, Harris (who still had the acetate) played the entire second side of the album. Now the entire album was out there, albeit circulating as a bootleg tape among fans. Two years went by, then Spirit finally resurfaced on Mercury records with a new double album Spirit of 76. It seemed like Potato Land would never be released, although calls for its release continued from fans throughout the world. Finally, in 1981, Potatoland was released – but it wasn’t the same version that had been premiered eight years earlier; instead it featured four newly recorded tracks on the first side of the LP, and the second side featured material from the first side of the original version, but heavily remixed with many new parts and overdubs added. Finally, in 2006, the original 1973 version premiered on the BBC was released with a half dozen bonus tracks (mostly live material taken from a 1972 Kapt Kopter show) and a short interview clip with California and Cassidy extracted from that Bob Harris show in April ‘73. Within the concept album, there are numerous references to Spirit’s earlier work, including a new version of their legendary ‘banned’ single “1984,” to set the Orwellian tone, and a reprise of it near the album’s end. “Natures Way” from Sardonicus also appears here in a reworked version, and in a short reprise titled “Nature’s Theme.” The core of the first side contains the five songs “Turn to the Right,” “Donut House,” “Fish Fry Road,” “Information,” and “My Friend,” which are all tied together into a suite with the story line dialog interspersed. These are all great songs that could stand strong on their own. The second side continues with a rockin’ version of “Walkin’ the Dog” that would have fit well on the Kapt Kopter... album, then continues with a series of potatoland related suites, reprises and dialog bits, ending up with the memorable song “It’s Time Now” (which would later be repurposed as the closer for the Son of Spirit album in 1975). This 2011 reissue of the “original” version includes a second disc which contains the entire 1981 Potatoland “re-make” album, with four additional bonus tracks, including “Midnight Train,” a song heretofore only available as part of a one-sided flexi-disc in Dark Star magazine around 1978. So with this two-disc version, one gets the ’73 original, the ’81 re-make, and a nice collection of bonus material all in a single package.